The pain connected to sciatica is infamous. In fact, there are recorded cases of patients crawling on hands and knees coming to the doctor’s office because of excruciating pain. So what are your options? Stay with us to find out how to get rid of sciatica and which sciatic nerve pain treatment is right for you. According to newest surveys, 4 out of 10 people in North America will experience sciatica pain at some point in their lives. The most usual manifestation is lower back pain with radiation into the leg. 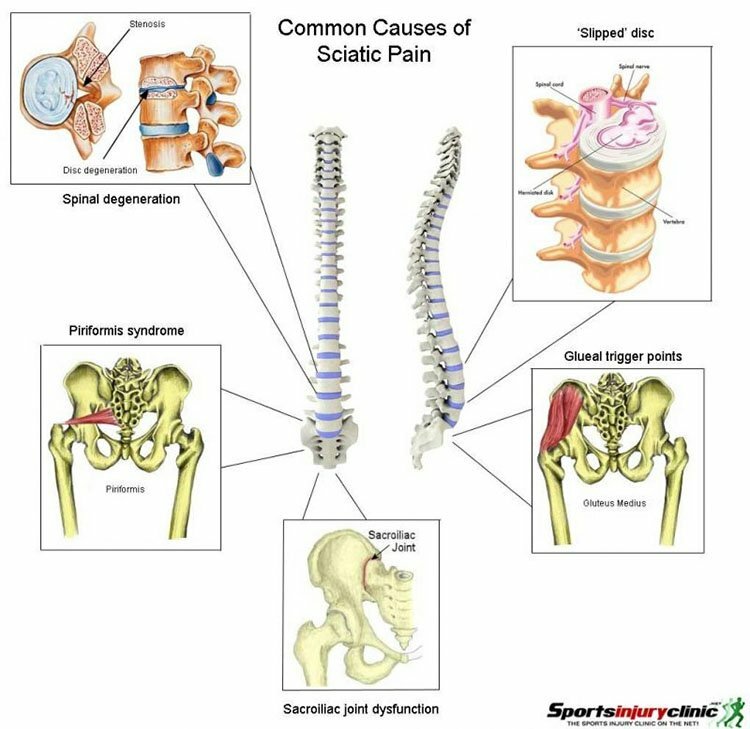 Sciatic pain is not always chronic, but it is usually produces certain level of pain and discomfort. Sciatica is leg pain caused by a pinched nerve located on either side of the lower spine. The pain courses through the sciatic nerve, which runs the length of each leg from the buttock down to the foot. The resulting “leg agony, called radiculopathy, is often worse than the back pain”, explained for the Health Science Journal, William A. Abdu, MD, medical director of the Spine Center at Dartmouth-Hitchcock Medical Center. Usually felt in one leg, the sensation “can be intolerable,” he continues. During the height of the pain, for some people the only way to move is by crawling. One of the causes for sciatica is lumbar disc herniation. Recurring mechanical stress to a spinal disc can cause the outer layers of the disc to tear, which in turn allows the internal material to push its way out of the enclosed space. This herniation occurs most commonly at the weakest point of the spinal disc, which is the area where the nerve root exits from the spinal canal and causing the feeling of numbness and pain radiating into the leg. Other less common causes if sciatica which can mimic the effects of lumbar disc herniation are degenerative disc disease and piriformis syndrome. The piriformis syndrome is a condition in which the piriformis muscle becomes tight and compresses the sciatic nerve as it passes through the gluteal region. How To Approach Sciatica Treatment? Before sciatic pain treatment can start, the underlying cause for the pain needs to be determined first. This is why it isn’t a good idea to start sciatic treatment on your own hand – you might be making your condition worse. By determining the underlying cause right away you take the first step towards curing the condition. Once diagnosis has been made, there are a number of measures that your doctor can recommend, surgery being a last resort measure. In the early stages of sciatica, using both heat and ice packs may help to reduce pain and inflammation at the source of the problem. Heat helps to loosen muscles while ice helps to reduce inflammation and swelling. Balancing your diet towards anti-inflammatory foods is also a good idea. Anti-inflammatory supplements, like curcumin and fish oil, are great natural alternatives to consider. Both chiropractors and physiotherapists use a range of treatments to help relieve pain and promote proper motion. These can include electrotherapy, ultrasound and other modalities, soft tissue therapy, exercises, joint mobilization, and manipulation. You can review the option together with your doctor and decide which treatment is right for you. 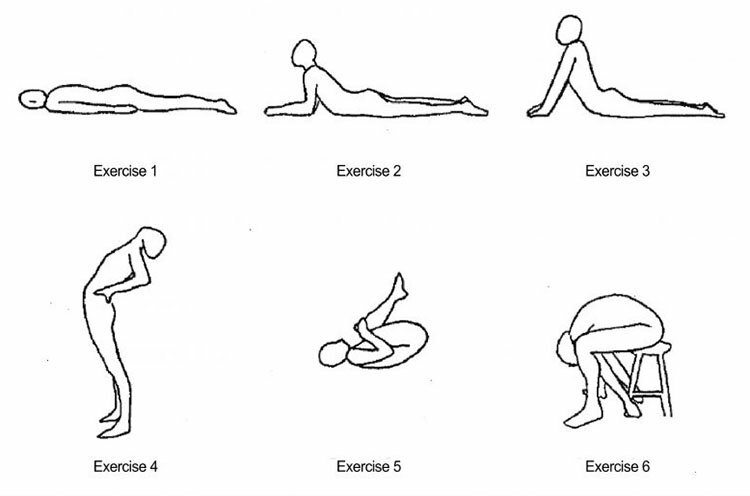 There are exercises prescribed by chiropractors and physiotherapists that are effective in decreasing leg pain and centralizing the pain (bringing it into the lower back), like the McKenzie exercises in the illustration above. There are also several specifically designed back stretches that have proven beneficial in treating sciatica. Check these 11 exercises and a video we selected here, designed so that most sufferers can perform them. The Alternative Therapies in Health and Medicine did a study in 2006 in which individuals experiencing moderate to intense back pain who practiced a combination of yoga and standard therapies (using medications) witnessed a drastic ease in the frequency and intensity of sciatica pain. Speak to your physiotherapist before starting this therapy. A lot of sciatica patients have reduced their symptoms with the help of acupuncture. This treatment includes small needled inserted at specific point in the muscles, along the meridian channels. Muscles experience micro-trauma so the endorphins hormone is released. This hormone helps to calm muscle and nerve pain. Some therapists use manual and instrument assisted traction therapy to help spread the lumbar vertebrae and allow disc material to become re-absorbed into the outer disc material. This is a good option to consider if your pain is not improving with other treatment types. There are a number of habits and conditions, like poor posture, tummy sleeping, prolonged sitting or wearing high heels that make your sciatica worse and hinder the treatment. Understanding and tackling these habits and conditions will make your road to recovery much shorter. For more info go here. If nothing else works, you can talk to your physician about painkillers and anti-inflammatory medications to help temporarily reduce the pain and inflammation. However, these medications have been linked to heart problems and should be used with caution – make sure to consult with your physician and pharmacist before taking pain killers. NOTE: Consult with your doctor before starting any treatment!